Dec. 13, 2016 – Following eight years of comprehensive federal environmental review, the Bureau of Land Management, U.S. Department of the Interior has issued its Record of Decision approving the TransWest Express Transmission Project. The TWE Project is a high-voltage, direct current (HVDC) electric transmission system being developed by TransWest Express LLC to directly and efficiently access diverse renewable energy supplies while reducing greenhouse-gas emissions. This significant energy infrastructure will strengthen the resiliency and reliability of the western U.S. electric grid by adding 3,000 megawatts of “backbone” transmission capacity between the Desert Southwest and Rocky Mountain regions. A Record of Decision is the final step for agencies in the Environmental Impact Statement process. The ROD was signed today in San Diego by Janice M. Schneider, Assistant Secretary, Land and Minerals Management, U.S. Department of the Interior. A Notice of Availability of the ROD for the TWE Project will be published in the Federal Register. BLM’s ROD follows the May 1, 2015, publication of the TWE Project Final EIS, which BLM and Western Area Power Administration prepared as joint lead federal agencies. The Final EIS reflected years of detail-driven environmental analysis, public input and collaboration among 50 federal, state and local cooperating agencies. BLM and WAPA each issue a separate ROD to document the agency’s decision pursuant to its unique purpose and need, including any required conditions and stipulations. The BLM ROD approves issuing a right-of-way grant for the TWE Project on BLM-managed land, which represents about 60 percent of the 730-mile route. TransWest has committed to hundreds of project-specific mitigation measures, best management practices and conservation actions designed to avoid, minimize and mitigate potential impacts of this infrastructure project to the environment. “The Western U.S. needs new interregional transmission infrastructure like the TWE Project, which will allow California and other Desert Southwest utilities to directly access high-capacity Wyoming wind to balance and diversify their generation portfolios in a cost-effective manner,” said Bill Miller, president and CEO of TransWest, an independent transmission developer. The project’s construction is estimated to create up to 1,500 direct construction jobs each year for an estimated three-year construction period. With a shared commitment to creating employment opportunities and strengthening the Western electric grid, the Ute Indian Tribe of the Uintah and Ouray Reservation, the International Brotherhood of Electrical Workers, and the International Union of Operating Engineers have signed partnering agreements with TransWest for construction of the TWE Project. 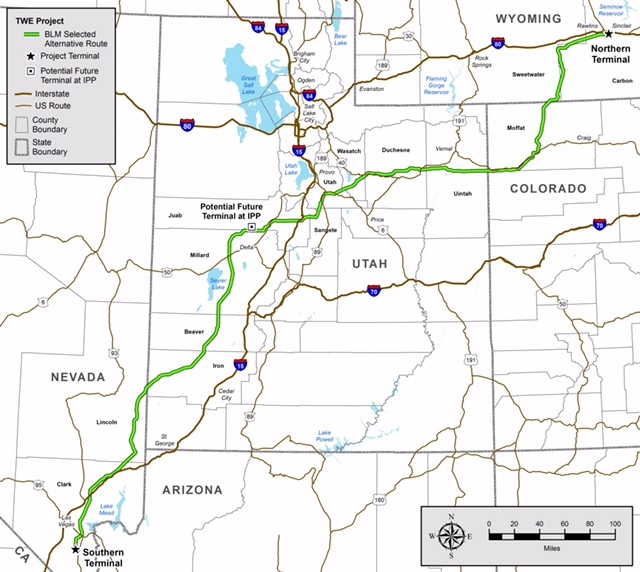 The TWE Project will extend from south-central Wyoming, to the site of a potential interconnection near Delta, Utah, and then to the Marketplace Hub near Hoover Dam in southern Nevada, which provides interconnections to the California, Nevada and Arizona grids. The EIS and other related documents are available on BLM’s website. TransWest’s right-of-way application for the TWE Project was filed with the BLM on Dec. 12, 2008. The Draft EIS was published July 3, 2013. Facts about WAPA’s Transmission Infrastructure Program.